When patrolling, the soldiers of BD “Luzhanka” noticed two unidentified persons moving towards the state border. During the offenders’ apprehension, the citizens of Iraq, Police made a warning shot up. Currently, the foreigners are taken to the Border Department for performing filtration and verification actions and preparing the protocols on detection of the crime signs under the Part 2 Article 204-1 of AICU “Illegal cross or attempt of illegal cross of the state border of Ukraine”. 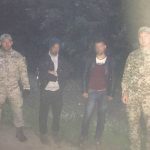 This entry was posted in Translated Media-News from Ukraine and tagged border, citizen, guards, Iraq, offender, state border on July 2, 2018 by oksana.